Poster Contest Winner, Grade 10+ category, Malisa, Kapolei High School, Hawaii. 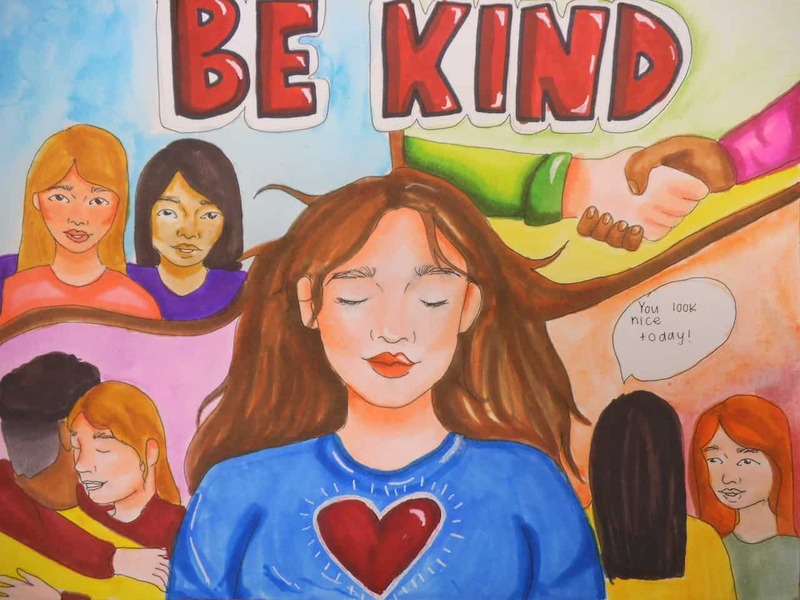 A grant program in existence since 2013, and a coloring contest, have helped promote the effects of bullying and the importance of kindness throughout schools, while also donating over $250,000 and counting to school initiatives. Now called United to End Bullying, the program launched by school bus technology provider Seon in 2013 focuses on creating an encouraging atmosphere for students through outreach initiatives. Those help them understand the effects and negative consequences bullying can have, both short and long-term. The program was started in response to a suicide by a young teen and the impact it had on the surrounding community. At about the same time, Seon became involved with Pink Shirt Day, an event that started in Canada, after students overheard peers making fun of a new student for wearing a pink shirt. The entire school bought in, and everyone wore a pink shirt to school. Pink Shirt Day soon spread throughout the nation. Seon then created an annual grant for the United to End Bullying program, and began donating $25,000 each year to school districts that promote kindness and a bully-free zone in their schools. Safe Fleet acquired Seon in 2015 and the grant was then doubled in size. Last year, 56 grants were provided, due to the number of applications received, and the need the various school districts had for a preventive bullying program for their students. Lynne expressed her passion for the United to End Bullying program, and the impact it has had on students and school districts. After the grant recipients receive their awards, Lynne circles back and interviews those recipients, she writes articles to encourage others. Along with the grant, Seon also started a coloring contest in 2013 that focused on different themes each year. The 2018 contest was themed “Be Kind” and ran for six weeks. The company received over 2,800 submissions. The coloring contest grants consist of six winners, and each winner receives $500 towards their school. In addition, the six runner-ups receive a $100 grant for their school. This doesn’t include the variety of gift cards and prizes that are awarded directly to the artists. School districts use the prize money for a variety of different programs to help promote kindness. The movement centers around encouraging good behavior and rewarding it. 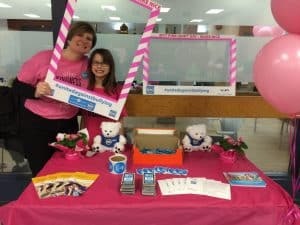 United to End Bullying buys buttons, stickers and small “Buddy the Bear” stuffies to give away at school and community events and create awareness on bullying and kindness. Meanwhile, growth in the United to End Bullying program has been evident, so there are now 13 divisions with a coordinator in each. They provide outreach by presenting awards and speeches as well as attending community events. On Friday, the program will award a school district a grant of $500 for its “Culture of Kindness” initiative. The money was donated by Seon staff that was collected at their last two Pink Shirt Day Bake Sales. The response has been overwhelmingly positive, Lynne added. She said she receives many emails and responses from principals and teachers explaining how much this program has influenced their student’s day-to-day lives. For example, it provides “I Heart Kindness” buttons that recognize students who are observed being considerate to others. Lynne said a teacher emailed her about the buttons that staff award to students with. The teacher said the program has made a positive difference in the school culture. The kindness initiate does not just start and stop in schools. Lynne said that school bus drivers have an opportunity to observe students, help the students and alert proper personal if they see a change in behavior. Lynne discussed the importance of school districts working with their bus drivers. In one school district, students and bus drivers would each vote for who they thought was the kindest. At the conclusion of each month, the winning bus driver and the student would be presented with certificates and be announced in the school newspaper. “There is a lot that can be done with the schools working with the school bus and the transportation department. There is a lot they can do working together to encourage kindness and help the kids,” Lynne said. Applications will open for the 2019 grant on Feb. 1, with submissions accepted through March 31. The focus of the grant for this year is on student leadership teams.